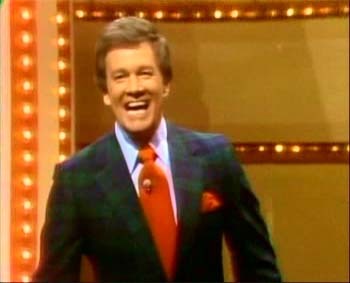 In the history of TV game shows, no name is more synonymous with "host" than Wink Martindale - the man who has guided 19 broadcast network, national cable and syndicated TV games. He has hosted more game shows than anyone except Bill Cullen. But Wink's years in broadcasting encompass more than his hit TV game shows. Before TV, there was radio. Before the games, there was a Gold Record. Along with "host" there have been many producer credits as well. Winston C. Martindale - nicknamed "Wink" by a neighborhood pal - was born and raised in Jackson, Tennessee - the only member of his family of seven to be in broadcasting. "I guess I broke the mold" he laughs. "I think that I was born with a desire to be a radio announcer. I always had that great desire to sit behind a microphone. My first 'mike' was two paper cups attached to a string." It wasn't long before he was sitting behind the real thing. After years of pestering his Sunday School teacher - who happened to manage one of the local radio stations - Wink auditioned for WPLI at age 17. He got the job just three months before graduating from Jackson High School. "They gave me a job at $25 per week, and for that you were expected to do everything", he says. "You read commercials, the news - play-by-play high school football and basketball, and you played records. If the floor needed sweeping, you did that too." Over the next two years, Wink graduated to even-larger stations in Jackson and eventually to the station of his dreams - WHBQ in Memphis, which he listened to as a teenager. He hosted the station's popular "Clockwatchers" morning show while attaining a Bachelor of Science degree from Memphis State University (now University of Memphis). Just months after landing the radio job, WHBQ-TV signed on the air and Wink became a popular local television personality as well. His success in memphis led to Los Angeles, where he hosted radio and television programs for KHJ. At the same time, Wink's career took an unexpected turn. Dot Records, Randy Wood, tapped him to record a pop version of a previous hit country narrative - "Deck of Cards". The recording shot to the top of the charts, earned Gold Record status - and a appearance by Wink on the "Ed Sullivan Show". After years of carving out a place for himself as one of the most popular air personalities in Los Angeles - primarily popular local radio and television programs - Wink felt a change was due. "I had been a deejay since I was 17. " he says. "My roots were in radio, but I thought it would be fun to try my hand hosting a television game. I'd become addicted to Allen Ludden's popular show, "Password". And after hosting a local version of "What's This Song", a musical show featuring celebrities, NBC added it to its daytime lineup". Wink had found his niche. In the years since "What's This Song", Wink has hosted an impressive array of shows, including: "Tic-Tac-Dough, "Trivial Pursuit, " "Can You Top This," "Gambit," "High Rollers," and "Debt." He also produced the syndicated "Headline Chasers," in association with Merv Griffin and KingWorld. He and his late partner, Bill Hillier, were the first to produce real-time interactive game shows for The Family Channel ("Boggle", "Jumble" and others). In June of 2006, Wink was honored with his star on the Hollywood walk of Fame. It can be found between those of Suzanne Sommers and Tom Hanks on Hollywood Boulevard. Wink shows no sign of slowing his pace. He is the national spokesperson for Orbitz travel on both radio and television, and he recently published his autobiography "Winking at Life". When not working, Wink lives in Calabasas, CA with Sandy, his wife of 32 years, and their three Chihuahuas.